Imagine having lunch and then sunbathing in the afternoon on one of St.-Tropez’s beaches and waking up the next morning in a castle in the midst of some of the most beautiful mountain scenery in all of Europe. This is the magic of Cote d’Azur and the close proximity of its many spectacular sights and experiences, and nowhere can this be better realized then by spending a night or two at the Trigance Castle adjacent to the Gorge du Verdon. It is the Gorge, not the castle, that brings visitors to the area, and with only ten rooms, the castle for most is going to be no more than a photo shot as one travels north from the village of Comps to the Gorge. For those lucky enough to stay there, though, Trigance Castle is likely to be the highlight of visiting this rugged, scenic area. In our stay, we were lucky enough to be upgraded to one of two rooms fit for royalty, but that was secondary to having a splendid dinner in the vaulted dining room and breakfast on a terrace surrounded by the rock-dominated mountains typical of the area. Having drinks on the outdoor patio in the late afternoon was a treat as well. 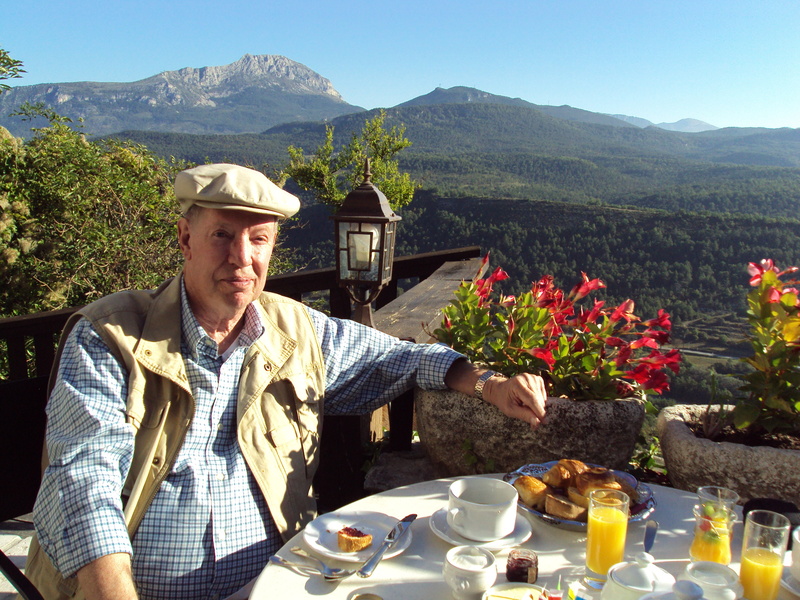 Author with breakfast at Trigance Castle. One does not go to the Gorge du Verdon, though, just to enjoy the pleasures of a luxurious castle hotel, and the Gorge does not disappoint. 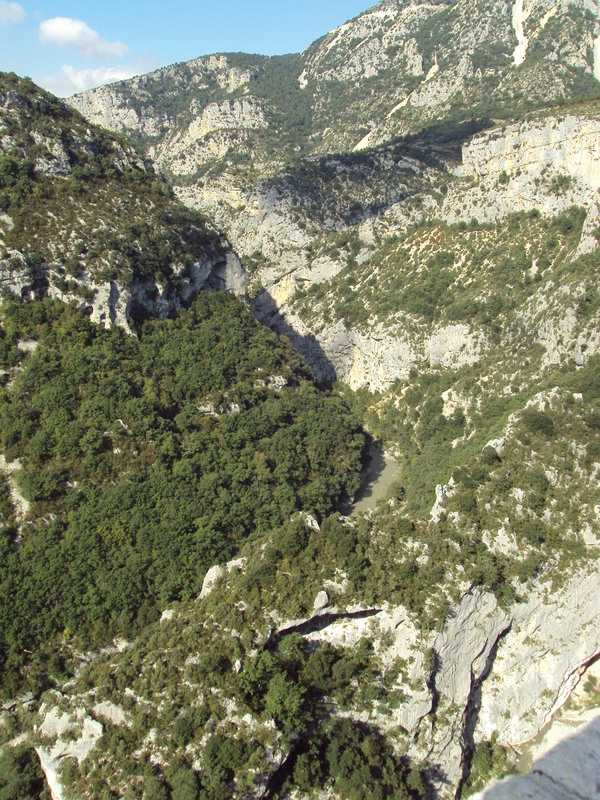 Most visitors come north from Route 8 through Draguignan and Comps and get their first look at the Gorge at the Mescla Balcun. What one sees from these stone balconies a few yards from the road are enough to let you know that you are seeing something quite unique with the winding and narrow Verdon River surrounded on both sides by rock formations rising more than 3,000 feet. A couple of miles west from the Mescla Balcun one comes to the bridge at Artuby that spans the Gorge and also provides spectacular views of the canyon. A little further to the east is a restaurant, Les Cavaliers, which looks out over the canyon. From there one can see hikers below as well as getting a good meal. At this point the road moves away from the Verdon River and passed the village of Aiguines before rejoining the river near where it intersects with Lac Ste. Croix, which brings a whole new perspective to the region. From the bridge across the Verdon north of Aiguines, on a nice day one looks down upon water filled with kayaks many of which are venturing into the gorge itself. While most will stick to their cars and cameras, the Gorge is a wonderful place for hiking and kayaking. Doing the full circuit of the Gorge requires heading north to the historic community of Moustieres-Ste.-Marie that dates back to Roman times and has a much visited church, Notre-Dame-de-Beauvoir with its chapel perched on the hill behind it. The present day chapel is built on the remains of its 9th century predecessor, and it is an easy 10 minute walk up the stone steps to get there and look down upon Moustieres and Lac St. Croix. Moustieres is another gateways to the Gorge and well worth the visit, even if not for an overnight stay. If not staying at the Trigance Castle, my personal choice for an overnight in the area is the 2nd century Roman village of Salinae that is today called Castellane – the other “gateway” to the Gorge. 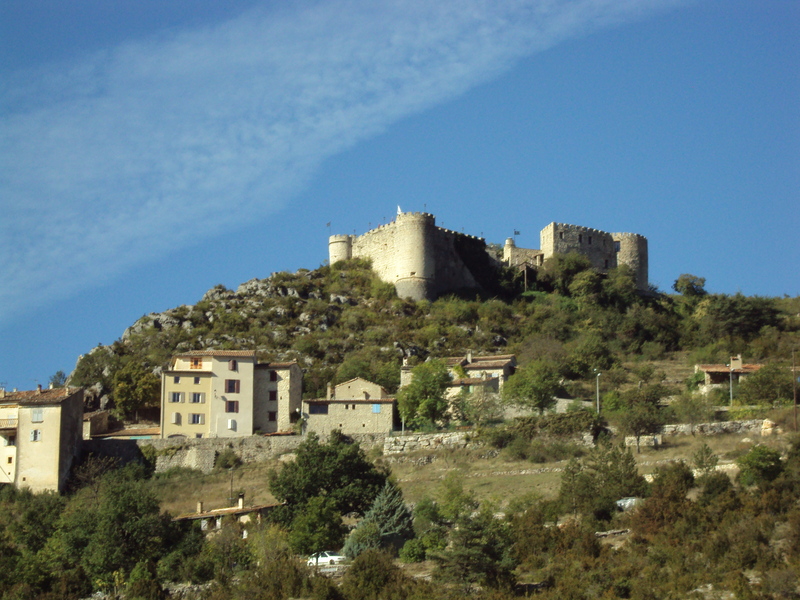 It was one of several villages in Roman times that were on or near the road that connected the Alpes-Maritimae capital of Cemenelum (now Nice) with Sisteron and other northern Gallic cities. Today that road is the Route of Napoleon and just north of Castellane, it winds its way through a tunnel cut through stone that is relatively unique for such a major highway. 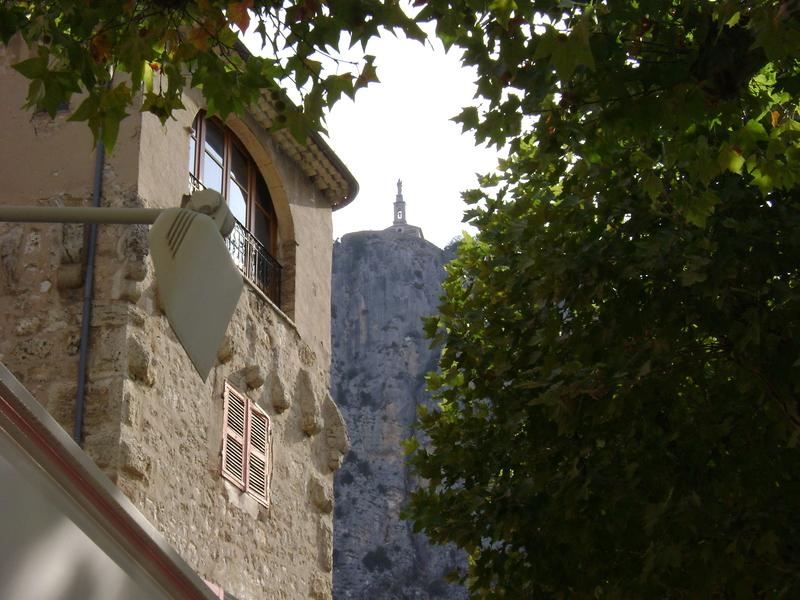 Castellane is a great place to spend an overnight before or after visiting the Gorge and is worth a visit in on its own merits just to see the Notre-Dame-de-Roc perched on a cliff behind the medieval Church of St. Andrew, 590 feet above the village. For those with the energy, it is a 45 minute walk to the top to see the view that those who lived on the top of the hill centuries ago considered a necessity of a dangerous life rather than a thing of beauty. At the bottom of the cliff sits Castellane’s peaceful village square, which includes a great place to spend the night – the Nouvel Hotel du Commerce. It serves an excellent dinner, has nice rooms and is well-located for enjoying this quiet town that has seen so many visitors pass through for centuries. This blog includes excerpts from my book, A Traveler’s History of Cote d’Azur. 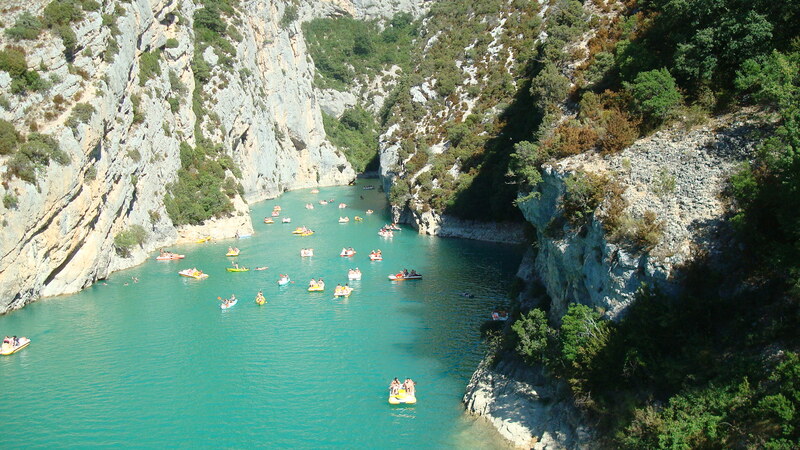 This entry was posted in France, Gorge du Verdon, South of France, Var. Bookmark the permalink.